Home / android / discount / myphone / News / sale / smartphone / MyPhone's Mega MerryGalo Sale with up to 50% off. 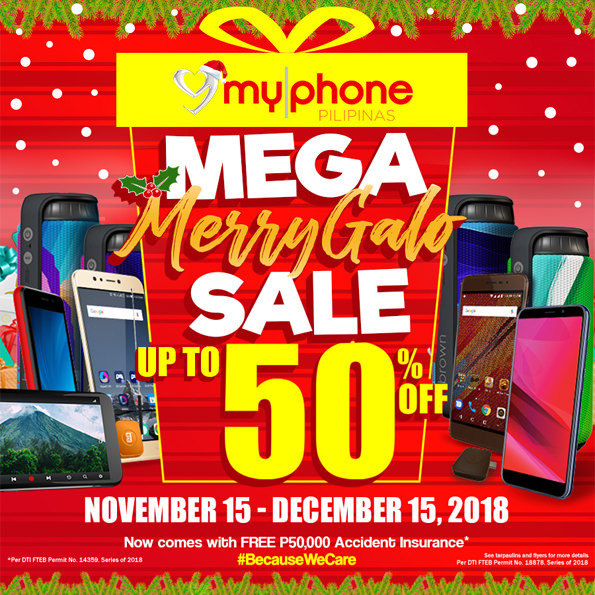 MyPhone's Mega MerryGalo Sale with up to 50% off. Looking for that perfect Christmas gift for December? We made Christmas more exciting for all Filipinos as we make our Maagang Pamasko Sale even bigger with new and more products to choose from! So, stop by any MyPhone shops for MyPhone’s MEGA MERRYGALO SALE! Expect selected items to be up to 50% off starting November 15. There's more! making your holiday season even more eXciting! Hooray as they added more choices on the X series. Meanwhile, the MyA1 and MyA2, MyPhone's budget-friend quad-core android phones, are both made even more affordable at PHP200 off! Score one for only PHP 1,499 each! As they want your Christmas to become even merrier, they added more choices of Android GO models so you could have more options on what to give to your loved ones.